Image interpolation occurs in all digital photos at some stage — whether this be in bayer demosaicing or in photo enlargement. It happens anytime you resize or remap (distort) your image from one pixel grid to another. Image resizing is necessary when you need to increase or decrease the total number of pixels, whereas remapping can occur under a wider variety of scenarios: correcting for lens distortion, changing perspective, and rotating an image. Even if the same image resize or remap is performed, the results can vary significantly depending on the interpolation algorithm. Itis only an approximation, therefore an image will always lose some quality each time interpolation is performed. This tutorial aims to provide a better understanding of how the results may vary — helping you to minimize any interpolation-induced losses in image quality. The more temperature measurements you have which are close to noon, the more sophisticated (and hopefully more accurate) your interpolation algorithm can be. Unlike air temperature fluctuations and the ideal gradient above, pixel values can change far more abruptly from one location to the next. As with the temperature example, the more you know about the surrounding pixels, the better the interpolation will become. Therefore results quickly deteriorate the more you stretch an image, and interpolation can never add detail to your image which is not already present. The 90° rotation is lossless because no pixel ever has to be repositioned onto the border between two pixels (and therefore divided). Note how most of the detail is lost in just the first rotation, although the image continues to deteriorate with successive rotations. One should therefore avoid rotating your photos when possible; if an unleveled photo requires it, rotate no more than once. The above results use what is called a "bicubic" algorithm, and show significant deterioration. Note the overall decrease in contrast evident by color becoming less intense, and how dark haloes are created around the light blue. The above results could be improved significantly, depending on the interpolation algorithm and subject matter. Common interpolation algorithms can be grouped into two categories: adaptive and non-adaptive. Adaptive methods change depending on what they are interpolating (sharp edges vs. smooth texture), whereas non-adaptive methods treat all pixels equally. Non-adaptive algorithms include: nearest neighbor, bilinear, bicubic, spline, sinc, lanczos and others. Depending on their complexity, these use anywhere from 0 to 256 (or more) adjacent pixels when interpolating. The more adjacent pixels they include, the more accurate they can become, but this comes at the expense of much longer processing time. These algorithms can be used to both distort and resize a photo. Adaptive algorithms include many proprietary algorithms in licensed software such as: Qimage, PhotoZoom Pro, Genuine Fractals and others. Many of these apply a different version of their algorithm (on a pixel-by-pixel basis) when they detect the presence of an edge — aiming to minimize unsightly interpolation artifacts in regions where they are most apparent. These algorithms are primarily designed to maximize artifact-free detail in enlarged photos, so some cannot be used to distort or rotate an image. Nearest neighbor is the most basic and requires the least processing time of all the interpolation algorithms because it only considers one pixel — the closest one to the interpolated point. This has the effect of simply making each pixel bigger. 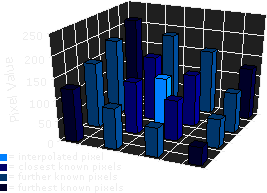 Bilinear interpolation considers the closest 2x2 neighborhood of known pixel values surrounding the unknown pixel. It then takes a weighted average of these 4 pixels to arrive at its final interpolated value. This results in much smoother looking images than nearest neighbor. 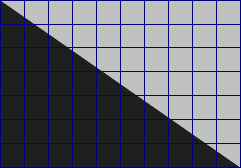 The diagram to the left is for a case when all known pixel distances are equal, so the interpolated value is simply their sum divided by four. Bicubic goes one step beyond bilinear by considering the closest 4x4 neighborhood of known pixels — for a total of 16 pixels. 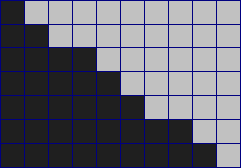 Since these are at various distances from the unknown pixel, closer pixels are given a higher weighting in the calculation. Bicubic produces noticeably sharper images than the previous two methods, and is perhaps the ideal combination of processing time and output quality. For this reason it is a standard in many image editing programs (including Adobe Photoshop), printer drivers and in-camera interpolation. 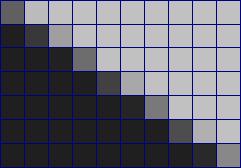 There are many other interpolators which take more surrounding pixels into consideration, and are thus also much more computationally intensive. These algorithms include spline and sinc, and retain the most image information after an interpolation. They are therefore extremely useful when the image requires multiple rotations / distortions in separate steps. However, for single-step enlargements or rotations, these higher-order algorithms provide diminishing visual improvement as processing time is increased. All non-adaptive interpolators attempt to find an optimal balance between three undesirable artifacts: edge halos, blurring and aliasing. Even the most advanced non-adaptive interpolators always have to increase or decrease one of the above artifacts at the expense of the other two — therefore at least one will be visible. Also note how the edge halo is similar to the artifact produced by over sharpening with an unsharp mask, and improves the appearance of sharpness by increasing acutance. On the other hand, some of these "artifacts" from adaptive interpolators may also be seen as benefits. Since the eye expects to see detail down to the smallest scales in fine-textured areas such as foliage, these patterns have been argued to trick the eye from a distance (for some subject matter). A major obstacle when enlarging an image is preventing the interpolator from inducing or exacerbating aliasing. Many adaptive interpolators detect the presence of edges and adjust to minimize aliasing while still retaining edge sharpness. Since an anti-aliased edge contains information about that edge's location at higher resolutions, it is also conceivable that a powerful adaptive (edge-detecting) interpolator could at least partially reconstruct this edge when enlarging. Many compact digital cameras can perform both an optical and a digital zoom. A camera performs an optical zoom by moving the zoom lens so that it increases the magnification of light before it even reaches the digital sensor. In contrast, a digital zoom degrades quality by simply interpolating the image — after it has been acquired at the sensor. Even though the photo with digital zoom contains the same number of pixels, the detail is clearly far less than with optical zoom. Digital zoom should be almost entirely avoided, unless it helps to visualize a distant object on your camera's LCD preview screen. 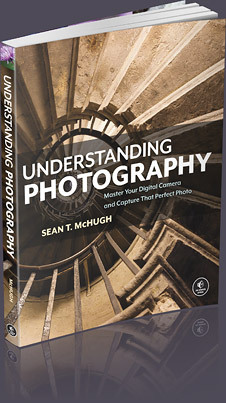 Alternatively, if you regularly shoot in JPEG and plan on cropping and enlarging the photo afterwards, digital zoom at least has the benefit of performing the interpolation before any compression artifacts set in. If you find you are needing digital zoom too frequently, purchase a teleconverter add-on, or better yet: a lens with a longer focal length.